This year, experience the holidays with a story of love, peace, and compassion! Meet Dana, a forthright and fun-loving reindeer who lives in the Arctic. On Christmas Eve, she meets Santa Claus, who has come looking for reindeer to pull his sleigh. 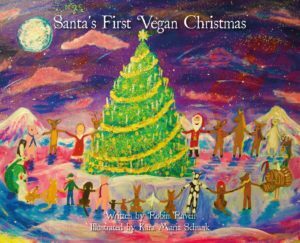 Dana gently opens Santa’s eyes to how we can be more kind to animals. Together they take off on a journey around the world, spreading far more than holiday cheer and giving far more than presents. By the time the sun rises on Christmas Day, things will never be the same!